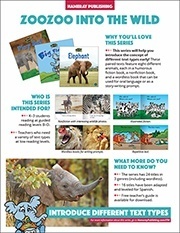 This guest post by Susan Bennett-Armistead, author of our My World informational texts, is part of an ongoing series in which she discusses informational text and its benefits and uses. Check back regularly to catch her next post! I confess. I love using wordless picture books with children. I love to hear them make up stories from the information provided in illustrations. I love hearing them use storybook language when they structure their unique telling of the story. I love how they let me in on their thinking, their vocabulary, and their creativity, as they make something out of nothing. There are so many marvelous wordless storybooks available that it’s easy to unleash their storytelling creativity. What I love even more, though, is challenging children with a wordless informational text and inviting them to “tell me all about __________.” Children who have been exposed to informational/explanatory text are able to quickly adjust from the “Once upon a time” structure of stories to the general informative style of an informational text, “Some insects are big. Some insects live in a tree. Some insects live in the ground,” simply by looking at the photo provided and sharing something the photo is conveying about the topic. 1. Include informational text in your read aloud before introducing the wordless books. Children who have been exposed to the structures and format of informational text have a leg up in being able to produce it. Talk about the features as you read the text so children know what you’re noticing about the text. Compare the structure with stories that are structured differently. 2. Include wordless informational text in your library. This is tricky because there aren’t a lot of these on the market. In addition to books in Hameray’s My World, you might also include Ermanno Cristini’s out of print but still available books, In the Woods, In the Pond, and In My Garden. 3. When using wordless books with children, invite them to “read” the book to you as if it were telling you all about the topic. Try using prompts such as, “I know you know a lot about animals that live in the woods. Read me this book all about animals that live in the woods.” Take dictation from the child as she reads the book to you so you can read her informational text back to her. Ask her if there’s anything she’d like to add or change. 4. Make your own informational wordless books. Invite your children to look through magazines and find pictures all about a topic of their choice. After gathering the pictures, have them glue the pictures to a piece of construction paper (one picture per page). Slip the pictures into page protectors in a binder and have the child read you the book as if it were a published text. Again, take dictation to capture the child’s text. - "Friends don’t be mean to each other." - "Don’t hit or push or bite." - "Me and Heather swing together." The children then read their previously wordless book to the class. Common Core State Standards bring growing attention to informational and explanatory text. By offering wordless books in the preprimary setting, we’re setting children up to be familiar with the features of that type of text. Additionally, wordless books are marvelous to use with children, since they’re so open-ended that they encourage children to take risks. There are no words to get wrong, and looking at pictures for ideas is what children do all the time when viewing text. With just a little support from us, they can stretch this risk-taking into increasingly rich and detailed writing—something every child needs! 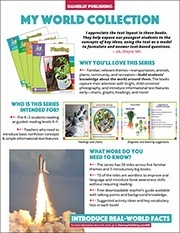 For more information on the My World series by this author, you can click here to visit the series page on our website or click the left image below to download an information sheet. To see some other wordless books available from Hameray, see Zoozoo Into the Wild (flip through a sample below!) 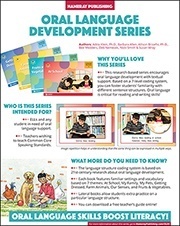 which combines realistic photos with illustration to tell a story, and Oral Language Development series, which features children in everyday settings and can be used as a writing prompt as well as to assess oral language.